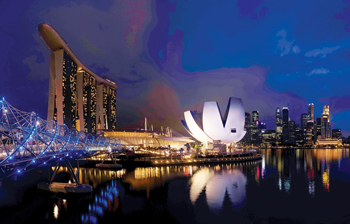 Singapore is once again Asia’s top meeting and convention city, according to the Union of International Associations (UIA) and International Congress and Convention Association’s (ICCA) 2014 global rankings released earlier this year. The city state also retained its spot as the UIA’s top international meeting city for the eighth year running, and at the top of Asia Pacific cities in ICCA’s rankings for the 13th consecutive year. Both rankings served to emphasise that event owners continue to regard Singapore as a top Mice destination. Further testament to the city state’s attractiveness is the magnitude and prestige of events recently won. These wins include the International Council of Nurses (ICN) Conference, which comes to Singapore in 2019, and the International Union for Physical and Engineering Sciences in Medicine (IUPESM) World Congress for Medical Physics and Biomedical Engineering two years later in 2021. Pinnacle events in their respective fields, the ICN conference and IUPESM World Congress are graced by industry thought leaders and top executives. Open interaction among attendees from different levels, areas of expertise and cultures helps promote knowledge-sharing, and improve the quality of information exchange. The 2019 ICN conference and 2021 IUPESM World Congress are each tipped to attract a crowd of some 3,000 overseas attendees, made up of professionals from the nursing industry, and biomedical engineers and medical physicists respectively. There is also good news for meetings and incentive travel. For instance, health care products firm Unicity International chose Singapore for the first time to host its Global Convention in 2016. It is expected to attract some 25,000 people, making it one of the largest incentive groups ever to come to Singapore. In 2015, there are also similarly high profile events making their debuts either in Asia or Singapore. Examples are the World Liquefied Petroleum Gas (LPG) Forum, Sibos 2015, the European Society for Medical Oncology (ESMO) Asia Congress, and the recently concluded West Point All-Academies Asia Summit. The World LPG Forum entered Singapore for the first time this September. The Forum is the world’s largest LPG event, attracting over 1,000 senior industry leaders from across the LPG supply chain usually. There, the key policy makers of the industry will discuss growth potential and explore new opportunities while forging new business relationships. Returning to local shores after 12 years is the world’s premier financial services event Sibos 2015, which took place in October. Last here in 2003, the four-day annual business forum attracted about 7,000 delegates from all over the world, potentially making this the largest Sibos in the Asia Pacific region. The ESMO Asia Congress in December marks the first time the society is holding a congress outside of Europe. Earlier this year, the prestigious West Point All-Academies Asia Summit was also the first-ever gathering in Asia of all US Service Academies graduates around the world, and boasted a distinguished list of panellists. Aside from the strong pipeline of events in Singapore, a key initiative helping to drive the Mice industry forward is the MICE2020 mid-term roadmap, which is a part of Singapore’s approach to quality tourism. The brainchild of a year-long consultation and ideation with the Mice industry, MICE2020 is centred around three core ideas to help give Singapore the edge in an ever-changing global landscape – offering Singapore as a destination with authentic local offerings and unique, experiential events; turning Singapore into a connected city with the digital capabilities to allow business visitors to do what they need to do seamlessly; and positioning Singapore as Asia’s MICE resource capital that is home to skilled talent and knowledge.